Are you tired of running wires through your house to keep your computers networked and connected to the Internet? Have you recently purchased a wireless data card only to discover that you have to open up your computer to install it? Don't worry, help has arrived. With the Linksys WUSB54GC Compact Wireless-G USB Adapter, you won't need power drills or screwdrivers to connect to the Web anymore. The Linksys WUSB54GC Compact Wireless-G USB Adapter converts a USB port into a 54 Mbps Wi-Fi connection. All you'll need is an available USB slot. You simply plug the adapter into your USB port, and immediately you'll be connected to your wireless network. It can't get much simpler than this. By incorporating USB 2.0 and Wireless-G protocols, the Linksys WUSB54GC can immediately begin delivering data rates up to 54 Mbps (five times as fast as 802.11b) without the trouble of running wires or opening up the case of your desktop computer. To install the adapter, you simply plug it into any available USB port. (It's compatible with both USB 1.1 and 2.0 ports, but 2.0 will yield the fastest speeds.) You can plug it directly into your PC, or you can use the included USB extension cord to put the adapter anywhere you'd like, up to five feet away. Because the adapter gets its power through the USB connection, no power cord is necessary. The included setup wizard walks you through configuring the adapter to your wireless network settings, step by step. The Linksys WUSB54GC lets you put your computer almost anywhere in the building, as long as you have a wireless signal to connect to. Once you're connected, you can keep in touch via e-mail, access the Internet, use instant messaging to chat with friends, and share files and other resources such as printers and hard disk storage space with other computers on the network. You'll also be able to connect with any of the growing number of public hotspots springing up in coffee shops, airport lounges, hotels, and convention centers. The new push-button setup feature makes it easy to configure your wireless devices. Just push the button on the access point and on your other enabled wireless device to automatically create a safe connection, protected by the industrial-strength security of Wireless Protected Access (WPA) and 128-bit encryption. This means that your data stays secure. WUSB54GC USB adapter, USB extension cable, setup wizard CD-ROM, user's guide on CD-ROM, and quick installation guide. Connect your USB-equipped desktop or notebook computer to a wireless network at incredible speeds with the Linksys Compact Wireless-G USB Adapter. 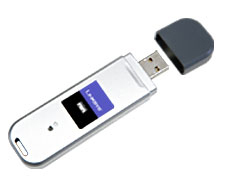 By incorporating USB 2.0 and Wireless-G the Adapter delivers data rates up to 54Mbps (5 times as fast as 802.11b), without the trouble of opening up the case of your desktop computer. To install, simply plug the Adapter into any available USB port. (It's compatible with both USB 1.1 and 2.0 ports, but 2.0 will yield the fastest speeds.) You can plug it directly into your PC, or use the included USB extension cord to put the Adapter anywhere you'd like, up to five feet away. It gets its power through the USB connection, so no power cord is necessary. The included Setup Wizard walks you through configuring the Adapter to your wireless network settings, step by step. 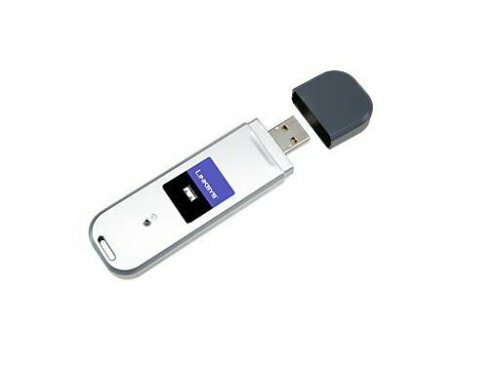 The Compact Wireless-G USB Adapter is also compatible with the Wireless-B (802.11b) network standard, with data rates up to 11Mbps. Your wireless communications can be protected by industrial-strength WPA and 128-bit encryption, so your data stays secure. network a printer with Linksys? WUSB54GC Wireless-G USB Adapter?? arrived on time, very complecated to install, took almost 6 hrs to get it work. but once its installed, dint have any problems. i don't know how people have problems with linksys . . . This is the second WUSB54GC that I have puchased. The first one was installed on a Windows XP machine about a year ago and it still works fine. The one I recently purchased installed on another XP computer with no problems. Windows XP found the new hardware and installed drivers for it. I did not even have to insert the installation CD. All I had to do was type in the password key for my wireless network and I was done. Nice & Small Adapter - You Can Move It to Other Laptops Or Desktops and It Works. Worked without a glitch. Was able to connect my Mac Book, Windows XP Laptop and Windows desktop without any problems. It's 2 months since I had it and not even a single issue. Worth the price. Great product from Linksys. I have an old Dell that I relegated to the corner of the basement for my young girls to play games on. They like to go on the Disney Channel online, so I wanted to give them internet access. The computer is so old (7 years old-which is ancient by computer standards) that I wasn't sure this adapter would work. The short answer-it works flawlessly. It took me 5 minutes to get it up and running. Perfect internet connection to my home network. It is so good in fact that I have to buy another one. I have 3 computers on my network, and I recently moved them around to different locations. My almost new HP computer, which has a built in wireless card, moved from right next to the router, to another room. After I moved it, I kept getting a very weak signal. Not sure why, but I just popped the adapter out of the old Dell and popped it into the new HP. Literally took me 2 minutes to get it going, and I now I have excellent signal strength. I now have to buy a replacement to put back in the old computer so my girls can access the internet. Just bought this for my desktop running over wireless. Took less than three minutes to set up initially and had it working fine on Windows XP (SP2). There used to be a problem with Windows FUS, but apparently that's been resolved; I had no problems. Vista works good... just keep your ethernet cable handy. I've been online since 92 with one ISP provider.This summer we Finally got broadband. Only problem was that we could not hook up 2 computers without punching holes is ceilings and walls, which was not acceptible. I than started researching and speaking to my "tech savy" friends(IT types)about how I could work around this house demolishing problem. They all came up with a "wireless router" solution, different brands depending on whom you listened to. The name that came up more often was "Linksys wireless G". Well I thought ok, this is the RIGHT one to get, since I beleive in staying on budget these things came one at a time. "No sense putting in a corvette engine into a Model T". Point taken,I had to get a new computer!!! (working with upgraded (Win98SE).Then I got the router, had it for several months before my research turned up this adapter,originally looking for good prices on PC Wireless Cards" as I had been instructed. Printed the info I found about this Wireless-G USB Adapter for me and emailed it to my friends. Needless to say they all agreed that this was a great find and even better than the cards they'd spoken with me about. It's been instramental in aiding my supervision of my grandchildren(10&5) online. They can't get online unsupervised without it being plugged in. I have TOTAL control. This is a great addition to my computing world. I received the Adapter promptly and started to install it. First sheet in the box said "if you have Vista operation system do not use this CD, but go to the internet to get correct driver". This could be a little problem, since the adapter is for getting to the internet. I had another computer to use to get the driver from the internet. Transferred the new driver to this computer and installed the adapter --- nothing happened. It came back "can not find driver". Tried several times and still nothing. Send at least a half day calling Linksys Tech. Assistance and going thru their phone maze and getting cut off several times, just to be told to do what I had been doing all a long. Finally someone decided it might be the unit and to send to them and they would replace it. Which I did and in about a week had a new unit. I loaded the driver I had gotten off the net and installed the adapter -- nothing !! The CD they provided with the new adapter looked just like the one I have sent in with the bad adapter, I decided to load it and installed the adapter again. It worked --- part of the time. I am about 25 feet from the router, but unless the adapter is on the extension USB chord provided and above my desk, it only works part time. It works great when I log-on, but if I leave the computer run and it go into "sleep" it will not work until log-off and log back on. Then works fine.